10C, with its three bedrooms, three baths, and spacious private lanai, is the perfect condo for the whole ohana. Sleeping 8 guests, the home also has plenty of common space. Cook your meals in the chef's kitchen and sit down to dinner as a family at the 8-person dining room table. Or, watch a movie on the living room's large flat-screen TV. The living room also has a comfortable king-size pull-out couch for extra sleeping space. The home's master bedroom has a king-size bed and a spacious en-suite bathroom. The first guestroom also has a king-size bed and en-suite bath, while the second guest room has two twin beds and uses the guest bathroom. With sleek, modern decor and a casual atmosphere, 10C will soon become your home away from home. 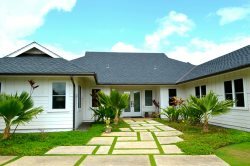 Location, Location, Location: Pili Mai 10C is right on the Kiahuna Golf Course and just minutes from shopping, restaurants, and the beach! Dogs allowed with pre-approval and pet deposit. Pili Mai 10C is a one story condo on the 2nd floor. so pleasant and helpful every time! Beautiful condo, not a single thing to complain about! Sandra. I did have to call a few times for minor issues and the staff and maintenance personnel were speedy and helpful! MANAGER RESPONSE: MAHALO! I left a message on the after hours voice-mail and got a response in minutes. The team member worked us through many options with our problem until the problem was solved. It made a frustrating situation much more bearable. I did not like the distance between the property and the beach, but otherwise it was an amazing space. There was plenty of room for multiple family members, and the lanai was a relaxing place to spend our evenings. The property was phenomenal, well kept, beautiful amenities, just a great overall experience! Could not ask for a friendlier staff or more professional overall great experience! Great lay out the property was very clean and had all the amenities. Close to a lot of different shops and easy walk to the beach! Spacious, clean, generous with all the amenities (soaps etc). We slept 7 comfortably. Great location. Great attention to detail. We had everything we needed. Extremely clean and well appointed. The place is awesome. Just as shown in the advertisement only better. Our balcony was looking at the the 9th (I believe) green and had wonderful sunset views. The place was very clean and welcoming. One of the best places I've stayed at. You won't be disappointed. I loved it but I will ask to make sure it's completely clean. There were some dirty items on the floor. Great place and great amenities. Still never received a call back about why we were charged $100 to use the pool for the week but other guests do not pay that fee. Just heard I'd get a call back. MANAGER RESPONSE: Mahalo for letting us know about the accidental charge for the club. You should see your refund by now. So glad to hear that you enjoyed your stay and we hope to see you again soon! Everyone was great. If we had questions they were answered quickly and efficiently. Unfortunately the fridge died just before we arrived and they had to replace the one they were using until the "new" one showed up. No biggie - they brought it in - took the old one out - they were great. All good - no worries. Beautiful property in the best area on the island in my opinion. The sunny south shore. Well stocked, clean, and beautifully decorated. It was as advertised on the website pictures. Lots of room for my wife, 2 kids and their Grandma. Would stay again for sure. Excellent service by text message. Great stay. Would be nice to have a pool on site. We didn't ever have to really contact them other than set up our reservations ... They were quick in responding to us with every question we had ... The hCondo was nicer than my own home very deluxe!!!! !